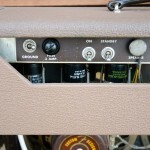 The Fender amps with a brown outfit were manufactured between 1960 and 1963, just after the tweed models and before the blackface models. They definitely have a sonic footprint of their own – falling roughly half way between the tweed and blackface models. 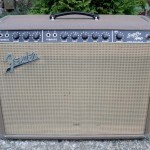 Let’s have a look at a classic Fender Super Amp from 1962. 40 Watts, two 6L6 output tubes and six 7025 preamp tubes and a GZ34 rectifier tube. 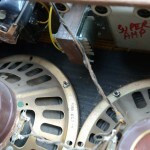 So there is a lot of glass inside this amp due to the complex vibrato (tremolo) circuit. Two channels – normal and vibrato with a presence control. Two Oxford 10K5 ceramic magnet speakers with stylish fender spaghetti logo’s on the dust caps. 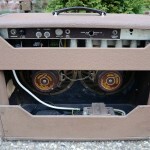 The cabinet is covered in the rough brown Tolex (Style 2) and has the wheat grille cloth used from 1961 to 1963. The output transformer is changed (this is a general problem with this types of amps) and an additional 220 Volt step-down transformer is installed. Basically this is a rare brown fender vibroverb without the reverb but with a complexer and different sounding vibrato. What really makes this amps special for me is the swampy sounding vibrato, which was only used in this type of amps. A Fender Tube Reverb Unit (reissue or original) refines the tone and adds flexibility to this amp. 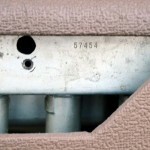 This entry was posted in amplifier, fender, guitar amplifier on 9. April 2012 by admin.